Northampton moved six points clear of Bath at the top of the Premiership with a tense victory over Newcastle Falcons. Stephen Myler converted his own try after kicking Saints' first penalty before Chris Harris's try and Tom Catterick's boot drew Falcons level. Saints' George Pisi made it 17-10 at half-time while a Calum Clark effort and a penalty try sealed a bonus point. Luther Burrell added a fifth try before Falcons replied through George McGuigan, Alex Tait and Richard Mayhew. 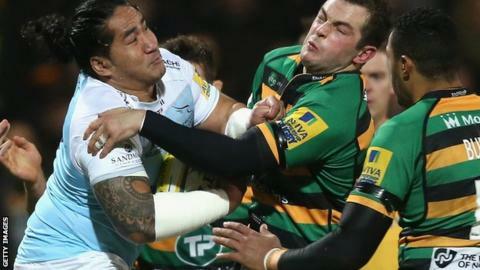 Newcastle's haul of 31 points, their biggest at Franklin's Gardens, earned them a losing bonus point. The win extends Saints' winning run to seven matches in all competitions, dating back to their 24-18 home defeat against Exeter Chiefs on 14 November. Stephen Myler's 17 points against Newcastle Falcons saw the fly-half pass the 2,000-point mark for Northampton. Only former England fly-half Paul Grayson has scored more points for Northampton than Myler. Visiting full-back Tait was called into early action with a try-saving tackle on Burrell. The England back had been brilliantly set free down the left by Samu Manoa, who charged down a Catterick kick before coolly collecting and off-loading to the powerful centre. But Myler soon got Saints on the scoreboard with his first sight of goal on nine minutes and he opened up a 10-point lead with a touchline conversion after crossing for the game's first try. The fly-half's touchdown illustrated Northampton's willingness to move the ball through the hands, with play moving from the left to the right wing where George Pisi set up Myler for the England man to score. Dean Richards's Falcons hit back with considerable style of their own, as Harris marked his first Premiership start for Newcastle by latching on to a deft grubber kick from Catterick to cross in the corner. Catterick added the extras and then made it 10-10 with a penalty. Northampton went close with Ken Pisi just failing to hold on to the ball under pressure after Chris Day did a superb job of popping a pass off the ground to the winger. Pisi's brother George did go over for Saints' second score before the break though, finishing another fluent attack by collecting a Myler kick behind Newcastle's defence. Myler slotted his second penalty after the break and Clark made the most of Northampton's one-man advantage to score their third try after Josh Furno was sin-binned for Newcastle. A driving maul then led to a penalty try, which allowed Myler to reach the 2,000-point mark of his Saints career with the conversion. Newcastle battled back into the contest, with McGuigan and Tait crossing before Burrell added Saints' fifth try. Mayhew burrowed over late on to ensure Newcastle left the Gardens with a point that lifts them one place to 10th in the table. "It's a winning start to 2015, it's five points and we're top of the league but I'm a little bit frustrated. "It was pleasing to get Stephen Myler off - he's played a lot of rugby - but then you want to keep going scoring tries. "We didn't. We showed a lack of concentration, conceded from a set piece and got driven over twice. "You get your five points but we took our eye off the ball. But it's a game which we have won and we're going in the right direction." "We have a great crop of youngsters coming through and they are holding their own in the top flight. "That pleases me greatly, the disappointing thing is conceding the field position to give them the tries a bit too easily, so we have got to tighten up in a few areas and then we will start winning a few more games." Northampton Saints: Foden; K Pisi, G Pisi, Burrell, North; Myler, Dickson; Waller, Haywood, Ma'afu; Dickinson, Day; Clark, Dowson (capt), Manoa. Replacements: Williams, Corbisiero, Denman, Nutley, Wood, Hodgson, Wilson, Stephenson. Newcastle Falcons: Tait; Harris, Powell, An Tuilagi, Barnes; Catterick, Blair; Fry, Lawson, Brookes; Green, Furno; Mayhew, Welch (capt), Wilson. Replacements: McGuigan, Vickers, Rogers, MacLeod, Saull, Tipuna, Clegg, Penny.